Matt MacKenzie’s shiny new motorcycle receives admiring glances from motorists waiting next to him at Wenatchee stoplights. But they do a double-take when the light turns green and MacKenzie zooms off — in complete silence. Matt MacKenzie uses his electric motorcycle mostly to get to and from work, but the bike can be driven off-road as well. 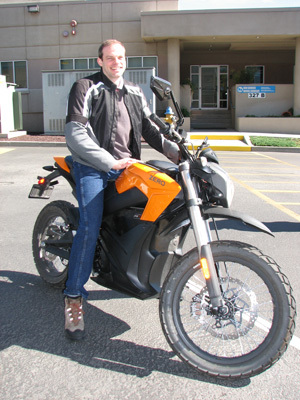 MacKenzie, an electrical engineer for Chelan County PUD, drives an all-electric Zero DS. The motorcycle has an in-city range of 120 miles before it needs a charge; the highway range is 76. MacKenzie drives mostly to his job at Rock Island Dam but he’s taken it on the highway where it’s rated for a maximum speed of 95 mph. Not that he’d ever go that fast, of course. MacKenzie said the $15,000 motorbike has plenty of power and can be driven off-road as well as on city streets. It’s said to be comparable to a 500 CC gas-powered bike. He said Zero’s 2014 model, which he purchased in Lynnwood in May, sports several improvements over the 2010 model he owns including regenerative braking/motor deceleration, improved motor, Bluetooth capability and higher battery capacity. It takes up to seven hours to recharge a drained battery using a 110-volt connection, but generally the battery never gets that low, he said. Because it’s an all-electric vehicle, MacKenzie is eligible for a federal tax credit. Zero oil – good. Zero gas – great. But zero noise? Friends have wondered if no noise could be a safety hazard, but MacKenzie said he has learned to ride the motorcycle more defensively. Motorists: Please watch out for Matt on his cool, quiet motorbike. Chelan’s Riverwalk Park will host the community’s 24th annual Earth Day Fair on Saturday, April 20, while Lions Club Park in Leavenworth is the site of the Life2 Earth Day Community Fair on Sunday, April 21. The Chelan fair runs from 9 a.m. to 5 p.m. Count on displays about composting, green building, recycling, renewable energy, land conservation, energy conservation, electric vehicles and emergency preparedness. There’s plenty to do and see, including a garden center, flea market, arts and crafts for kids, food booths, music and entertainment. The event is sponsored by the Lake Chelan Chamber of Commerce, KOZI Radio, Chelan County PUD and 509 State of Mind. In the event of heavy rain, the fair will take place under cover at Osborn Elementary School, 225 Central Avenue, Leavenworth. Phone (509) 548-0181 for more fair information. Now that we’ve built it, will they come? An article in EV Update features the efforts of Ron Johnston-Rodriguez and other promoters of Wenatchee Valley tourism to develop electric vehicle (EV) charging stations along the Stevens Pass Highway. The author drove a Nissan Leaf over the pass and talked to the folks behind the local EV movement. The latest counts noted in the article seem disappointing: Only about a dozen visitors have used the chargers installed a year ago at Sleeping Lady Resort in Leavenworth. The four high-speed chargers placed along the Stevens Pass highway in June have been used 200 times, the article notes. Little use was expected this travel season for two reasons, he said: EVs have only recently become commercially available; less than 2,000 are estimated to be in use in the Seattle area. And no effort to aggressively market the EV Corridor (over Stevens Pass) for the 2012 season was launched because of uncertainties over whether the Level 3 fast-charge stations would be installed, and when. Organizers wanted to “test drive” the stations — “we wanted to have some experience with the stations to be sure we could offer driving/charging advice, etc.” — before marketing their availability. “Add to that, we couldn’t see the point in organizing or funding an advertising program to the relatively small number of EV owners in Seattle in 2012,” he said. 2013 will be a different story, he said, with Ford, Toyota, Tesla, Honda and Fisker selling their vehicles in Seattle. The choices so far have been the Nissan Leaf, Mitsubishi iMiev or Chevy Volt. Attention Cashmere Middle School parents: If your seventh grader asks you for permission to ski behind a solar-powered car over the frozen highways of Canada, blame Jim White. White, a Chelan County PUD engineer, and Eric Sydenstricker, PUD technician, are helping students in Bob Martin’s seventh grade science class build their own solar-powered model cars. To introduce the concept, White showed the class a YouTube video of him ice-skiing behind a car that operates totally on solar energy. Not to be outdone, Sydenstricker led the class outdoors, putting his radio-controlled monster truck through a parking-lot snow bank to show off its road skills. The Cashmere demonstration in January kicked off a pilot program that’s bringing PUD employees into classrooms at four middle schools this year. Ruth Erwert, recruiting program manager and Bob Bauer, communications specialist at the PUD, brought the idea to the North Central Educational Service District (ESD). Mechelle LaLanne, ESD science coordinator, worked with teachers and ESD staff to develop the program. Erwert’s goal is to make students aware of career opportunities and “build a pipeline of future workers,” she said. LaLanne’s goal is to place experts in the classrooms to complement the curriculum, which in seventh grade focuses on energy, machines and motion. Entiat, where students are working with teacher Kevin Jones to learn about electrical circuits and how they operate mechanical devices. PUD experts offering help and encouragement are John Sagerser, Paul Resler and Cheryl Hobson. Pioneer in Wenatchee. Under teacher Carolyn Dotter, students plan to investigate the challenges of underwater welding and mechanics. PUD divers Donnie Lane and Brent Thrapp are assisting. Orchard in Wenatchee. Teacher Dan Myers is working with his students to build a working model of Rocky Reach Dam. PUD employees on that project are Dan Martyn, Tim Halliday, Andy Lolos and Eric Ostrom. PUD staff will be in the classrooms once a week for six to eight weeks. Then as soon as school is out, students can attend the Action Academy at Rocky Reach. For four half days during the week of June 18, they’ll show-and-tell about their projects, take tours of the dam, talk about how their classroom work correlates to work at the dam, and hear from more PUD staff about career options in other fields. “Whether students attend a four-year college, a technical school, or stay in the community and apply for an apprenticeship or entry-level job, we want them to realize there are opportunities with our utility,” Erwert said. Ron Johnston-Rodriguez is retiring this summer from the Port of Chelan County, where he’s been the tireless leader of efforts to make this region a nationally recognized center for plug-in electric vehicles. But he won’t be going far. He’ll become the new director of Plug-In North Central Washington. It’s essentially the same job he’s held for the past six years but with a new salary (none to start) and under the auspices of a different agency. The North Central Economic Development District is becoming the umbrella organization for Plug-In North Central Washington, formerly known as the Advanced Vehicle Initiative (AVI) Consortium. The district covers Chelan, Douglas and Okanogan counties. “I’m volunteering my time to help keep the momentum going,” Johnston-Rodriguez said. That momentum includes installation of electric vehicle charging stations at Stevens Pass and at Sleeping Lady Resort near Leavenworth. Both are Level 2 stations, requiring four to six hours for a full charge. The City of Leavenworth has applied for a grant to set up a Level 3 station, with a fast-charge time of 20 minutes. Several businesses, including the new Marriott Springhill Suites in Wenatchee and Icicle Ridge Winery in Peshastin, plan to install charging stations in the next year. Eventually, Johnston-Rodriguez said, there will be an extensive network of charging stations available from Seattle to Wenatchee. Johnston-Rodriguez serves on the Washington State EV Task Force which has applied for a $500,000 federal grant for infrastructure planning. Corporate sponsorships, membership fees, and revenue-generating events and services will augment grants and other sources for the new Plug-In North Central Washington, he said. He predicted 2012 will be a big year for electric vehicles. More all-electric Nissan Leafs, delayed due to the Japanese earthquake, will become available. State and federal funding will kick in to build the much-anticipated fast-charge stations on both sides of Stevens Pass. Businesses will learn more about EV and install their own charging stations. And consumers will be looking for information to help them decide whether to charge ahead with EV. The development of practical electrical vehicles and consumer acceptance of them is gratifying for Johnston-Rodriguez. Establishing a new Plug-In Center as a limited liability corporation under the regional economic development district makes sense and assures a permanent home for EV efforts, he said. “We’ve had 30 people (in the AVI Consortium) here who’ve been working on this for years,” he said. Members of the consortium performed ground-breaking work, including transforming the port’s white Toyota Prius into Washington’s first plug-in hybrid electric vehicle. The port’s goal – and Johnston-Rodriguez’s job – has always been to enhance economic development. But the focus has evolved. Initially the AVI group hoped to make Chelan County an important testing ground for plug-in hybrid vehicles. Now the push is to make the area friendly to eco-conscious tourists driving EVs and to attract visitors to demonstrations of EVs operating in real-world applications. The fact that the area’s electricity comes from clean, renewable hydropower is an added benefit, he said.